Forty-one years after he retired from baseball, Hall of Fame pitcher Sandy Koufax was the final player chosen in the draft to stock the six teams for the inaugural season of the Israel Baseball League. Koufax, 71, was picked by the Modi'in Miracle in the draft conducted by former major league general manager Dan Duquette, who heads baseball operations for the league and is a former general manager of the Boston Red Sox. "His selection is a tribute to the esteem with which he is held by everyone associated with this league," said former big leaguer Art Shamsky, who will manage the Miracle. "It's been 41 years between starts for him. If he's rested and ready to take the mound again, we want him on our team." Koufax wouldn't pitch Game 1 of the 1965 World Series for Los Angeles in order to observe the Jewish holiday of Yom Kippur. 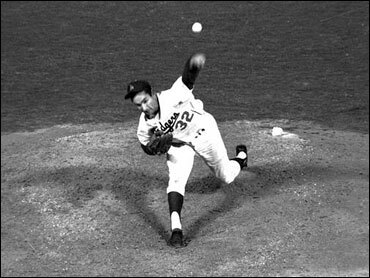 In his career with the Dodgers, in Brooklyn and Los Angeles, the left-hander threw four no-hitters, including one perfect game. He retired due to arm problems after the 1966 season and was later voted into the Baseball Hall of Fame. Koufax has made few public appearances in recent years. His most-visible involvement with baseball in the United States has been his annual visit to the New York Mets' spring training camp in Port St. Lucie, Fla. The Mets are owned by his former high school teammate, Fred Wilpon. The first pick in the draft was infielder Aaron Levin, 21, from San Luis Obispo, Calif., who played for Cuesta Community College. He was also selected by Modi'in. The league begins play June 24, with the six teams playing a 45-game schedule. Players from nine nations were drafted, and about a dozen of the 120 players in the league are expected to be Israeli citizens. Major League Baseball Commissioner Bud Selig is serving on the Israeli league's board of advisers. Other former major leaguers managing Israeli teams are Ron Blomberg and Ken Holtzman.